For the past eight months, I’ve been working at “a coffee shop.” I’ve hinted that said coffee shop was Starbucks, but I don’t think I’ve ever said it outright. 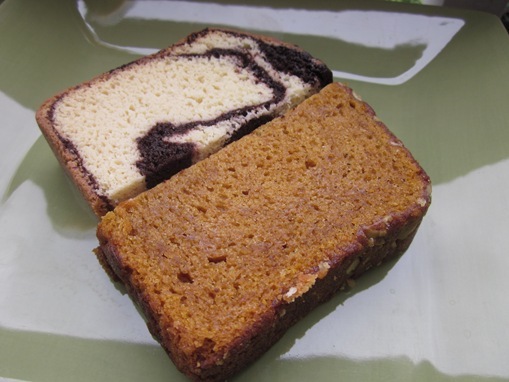 Surprise, now you know why I was always drinking so much chai and eating so much pumpkin bread. With only two weeks to go before I officially resign from my job as barista extraordinaire, I thought it would be nice to impart on you some things I’ve learned in the past 8 months. I spent the first couple of weeks having numbers and “repeatable routines” drilled into my head. There are different numbers for pumps of syrups for in hot drinks and cold drinks, different numbers of espresso shots in different drinks, numbers of scoops of this, that and the other. It all seems second nature now, but when you start out, it feels like you’ll never be able to remember it all. 2. Being a barista means being fast. Did you know shots of espresso only stay good for ten seconds? If you don’t mix them with some sort of liquid before that ten seconds is up, your shots “die.” That means that when your shots are pulling, or coming out of your machine, you only have as long as they take to pull + those ten seconds to start/finish another drink. 3. There are a lot of different coffee drinks. A misto is half brewed coffee, half steamed milk. Also known as a cafe au lait. A cappuccino is shots of espresso, half steamed milk and half foam. A latte is different from a cappuccino in that it’s shots of espresso, steamed milk and a tiny bit of foam on top. Macchiato is Italian for “to mark,” and the drink is made upside down, meaning the shots get poured on top. They mark the milk. Hey, it all makes sense now. 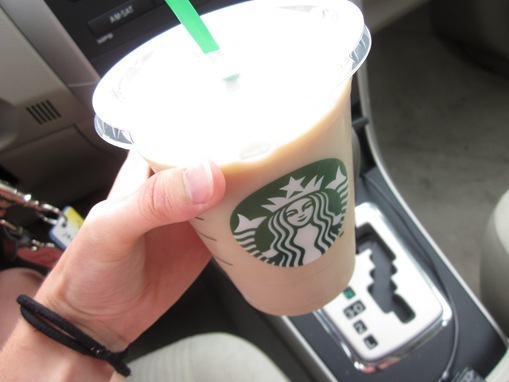 And did you know, a caramel macchiato is in fact made with vanilla, not caramel. 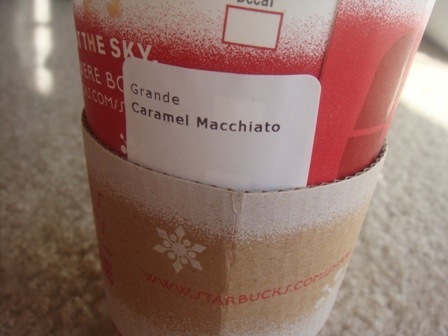 The only caramel in a caramel macchiato is the caramel sauce that’s drizzled on top. Misleading name, no? 4. The company itself really is great. 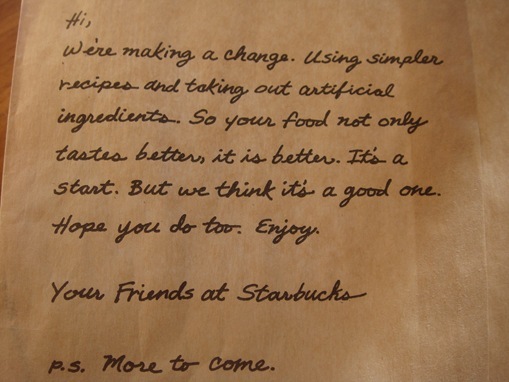 Starbucks really is a kind company. 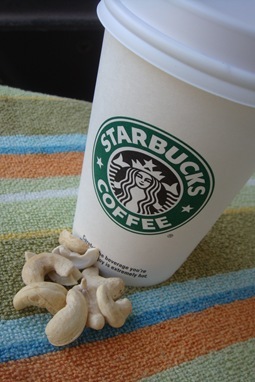 It gives it employees health insurance and all of its baristas are trained to make the customer happy. I know a lot of people who have worked in the food and drink industry and after seeing what goes on behind the scenes, refuses to eat/drink there anymore. I don’t feel that way at all! In fact, I’m impressed by how much of a clean and honest company Starbucks is. 5. 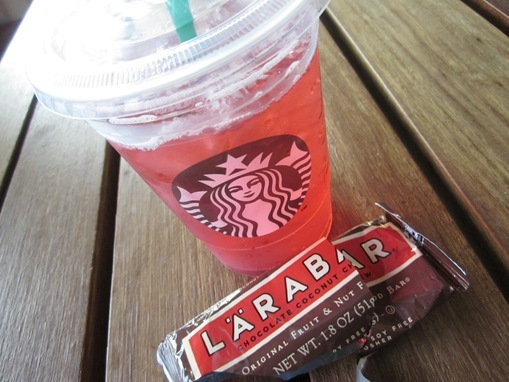 In order for a drink to be “skinny,” it has to be made with sugar-free syrup and non-fat milk. Therefore, you cannot order a “skinny latte” because there’s no syrup. It’s just a non-fat latte. 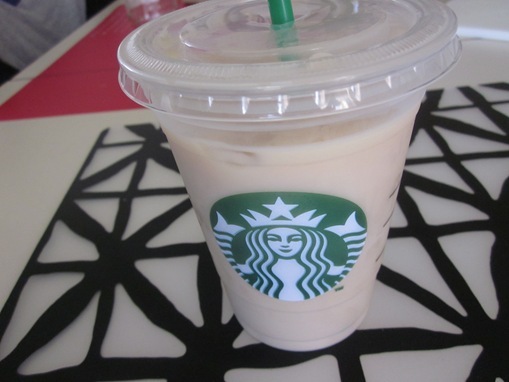 You cannot order a “skinny vanilla soy latte” because soy isn’t non-fat. 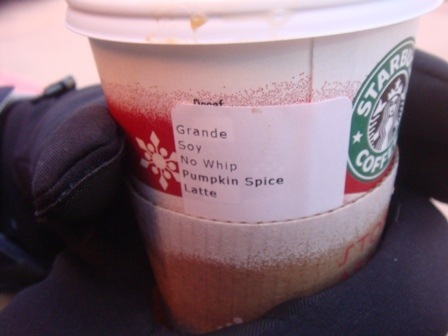 You cannot order a “skinny pumpkin spice latte” because pumpkin spice syrup isn’t sugar free. 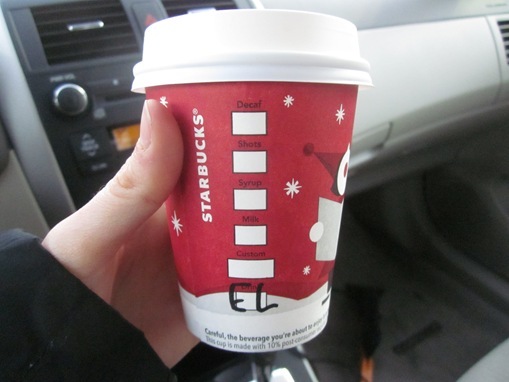 And lastly, you cannot order a skinny eggnog latte. It’s made with real eggnog and there’s nothing skinny about it. 6. You are trained to call out drinks in a certain order. You know that fancy box system on Starbucks cups? Technically, you’re supposed to call out the drink in the same order as the boxes. It’s hard to do at first. 7. Your fellow baristas start to feel like family. When it’s Black Friday and you’re serving coffee to a bunch of crazed shoppers who need coffee now, you and your fellow baristas will start/finish drinks for each other, pull shots on each others’ machines, reach over each other to grab blenders, pass pastries back and forth and generally be in each others’ personal bubbles for the entire length of your shift. All notions of personal space go out the window. You become close in both the figurative and literal sense of the word. 8. You will want to cry. I feel like my store was different in that it was inside a mall, so the holiday season was extra grueling. I worked shifts where the line was out the door the entire time. Where we ran out of milk, syrup, ice, lids and energy. Customers will treat you like you aren’t a real human being. They will ignore you when you say “hello,” talk on the phone as you get their order, blame you for things you have no control over and ask for drinks that are incredibly complicated. At the end of the day, you will have syrup stuck to your arms, your feet will ache and you will be physically and emotionally exhausted. 9. You will meet some of the hardest working people. 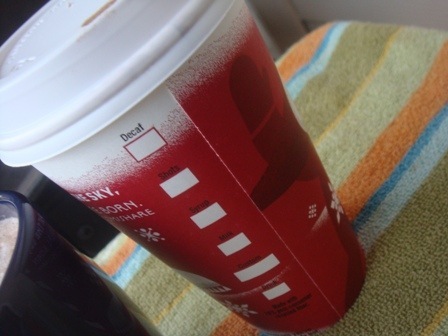 I worked with people who have been with Starbucks for years and I seriously commend them. I couldn’t do it. I worked with people who would stay late, come in early, bar (which just means you’re the one actually making the drinks) a rush at 8 months pregnant and carry in gallons of milk on their own. And I can vouch that no one gets paid enough for working that hard. 10. You will be amazed. Amazed by how much there is to know about something that seems so simple. Amazed by the great people you work with. Amazed by the awful hours you have to work. Amazed by how rude customers can be. Amazed by how nice other customers can be. Amazed that you even survived eight months there. Onto to something bigger and better! Were you surprised to find out any of these things? What the most valuable lesson you’ve learned at a job? Have you ever worked in the food/drink industry? Wow, I learned a couple things! Yeah I am always always amazed at Starbucks baristas, especially the ones who work at locations that are insane 100% of the time (like the one in Times Square…I get a little panic attack just looking at that line!). I always try to be nice to them but I feel like it makes little difference because so many people are just d-bags. I commend you for working a job that challenging…I don’t think I could do it! I worked at 4 coffee shops, assistant manger at one and manager of another. I never worked at a starbucks but I can relate to all of these. Now that I haven’t worked at one in a few years it amazes me how little I remember the bad things and rude customers, but I can still remember names and orders of some great customers. My past experiences also make me over-tip at coffee shops now but I guess it also makes me more picky too since part of me wishes I could still make my own drinks exactly how I like them haha. Anyways I can’t wait to hear about what comes next for you! I can appreciate what Starbucks does for their employees but I cannot appreciate them as a company… I just really dislike their coffee and what they’ve done to “Coffee” in the US. That being said, my brother is a Starbucks manager in NYC and he gets incredible health benefits and really loves his job. Also… I hate when I see baristas leaving their shots at the espresso machine after all the creme has gone! Come on… Barista 10!! And also… I sometimes really miss being a barista… I worked for 3 different local coffee shops and i loved getting to know the customers and the close knit aspect of the coffee team. In Portland, however, every other person has barista skills and if you can’t do latte art (I can’t) you aren’t finding a job anytime soon. I have always wanted to work at a Starbuck’s – weird? Looking for a job where I am valued and the effort I put in us appreciated…. I’m so sorry to hear that 😦 I know benefits were very important to all of us when I worked there and it’s disappointing to hear they aren’t offered everywhere. Thanks for your informative comment and I wish you the best of luck finding somewhere that treats you more humanely. Yeh It isn’t a horrible place to work because for what ever reason, every Starbucks has amazing people, and in every Starbucks I have made friends for life, and I also love alot of my regulars, you get to meet a lot of great people! When I wrote the post I was thinking more of the busy itself! I’m glad though that in America there alot of people getting health benefits etc. I find that great! Thank god I found this. I just started my second day of training today and I waited until I got home to cry. I feel like I’m lost and my brain is frazzled by the order of everything. I was mad at myself and my trainer is a stickler for everything.